Asus PadFone will solve the problems of "tablet hesitators"
Asus has been making the headlines lately by saying it will be among the first companies bringing Android 5.0 Jelly Bean devices to market and explaining that it will wait until the “right time” arrives to jump on the Windows Phone bandwaggon. But this here explanation of the target group for the Asus PadFone is particularly interesting. “Tablet hesitators” - that’s the group of people Asus thinks will be looking to buy the PadFone, a handset that slips into a tablet chassis, which in turn fits a keyboard dock, much like a matroska nesting doll. This means that you essentially pay for only one device with all the processing power, and everything else - the tablet screen and keyboard come as an additional, cheaper accessory. “There is a massive segment of the market called the "tablet hesitator" and those guys aren't buying our tablets," Asus said at MWC. "And they aren't buying iPads or Samsung tablets because they haven't got it yet - they don't want the double expense and they don't want to feel they are being fleeced by the operator on two contacts.There is a whole raft of reasons. What our solution does it try to answer the reasons for that tablet hesitator to get them involved." Benson Lin heading Asus’ handheld department then quoted numbers saying 55% of smartphone owners wanted a tablet, but only 13% bought one. Asus looked at the huge majority that didn’t get one and asked them why. "Many said they didn't want to pay the extra money for it or the extra data plan. We have done a lot of surveying and we think that is what people want. We are always trying to solve a problem." Does the Asus PadFone solve your problems? Let us know in the comments below. If this comes to verizon then I will definately be buying it (off contract unfortunately, couldn't pass up the nexus for my upgrade). I hadn't thought of it that way. Not a bad angle. The only fault is that people are going to need more options than just a single smart phone that can convert into a tablet. I doubt the 42% of people who didn't buy a tablet will all find the same smartphone appealing. Oh, and to answer the question posed in the article: yes, this does solve my problems. It replaces my dying EVO 4G, it provides me with a tablet, and the keyboard dock lets me write papers, spreadsheets, and presentations, so I shouldn't need my also-dying ASUS notebook any more. haha! that's exactly what my friend is doing right now.. an old monochrome Nokia phone, and a tablet with 3G.. he said he never missed a beat.. Yes, the problem as they define it could be most easily solved by the carriers allowing subscribers to use their data plans on more than one device. Carriers are of course not inclined to create a system whereby customer utility is increased (especially where data consumption might increase) unless they get paid lots more money. There is one other reason they don't want to allow pooling of data, though. A person could get a tablet and a phone and then give one to a spouse thus you really have 2 people using one contract. Having said that, I would definitely look at this padphone idea if it were on Sprint. If this was an LTE phone then that would be awesome. will the Prime keyboard dock be compatible with the padfone tablet? Fantastic presentation clip here, not sure about the 5 hit combo moves though but it was really funny, great work with grabbing the phone/fone from the tablet/pad. "Does the Asus PadFone solve your problems?" Yes, it absolutely does. check out exotablet.com/exotablet.htm hot on the heels at a quarter of the price - and you can use your current mobile so no need to learn a new phone. My current smartphone is closing on the end of its life cycle and I really need a new phone. I'd also love to get a tablet, but don't want to spend lots of extra for it. I've dreamed of this even before Asus first announced it last year. it's exactly what the Tablet Hesitatators need. depending on carrier availability this has the potential to be a big hit. it'll probably replace my dad's Bionic and it's Lapdock 500 unless the ICS update brings improvement to Webtop. the padfone is a godsend. it has an S4 which is substantially better. it would be worth it if you buried your Note into it somehow. Yeah, but Qualcomm's S3 processor was just plain out horrible after owning a Sensation and using the AT&T GNote. But I did look at the HTC One X, and it looked much more smoother. If the tablet has the 1900x1200 resolution like the Prime Infinity then I might just get it. 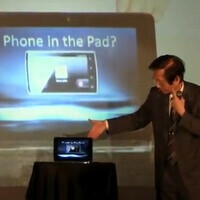 Samsung should've made something like this when they announced the Note 10.1.
does it solve a problem? heck yea. tablets right now are essentially large screen smartphones with very little that differentiates them. snapping your phone into a large screen (with its own extended battery) really helps the dilemma.